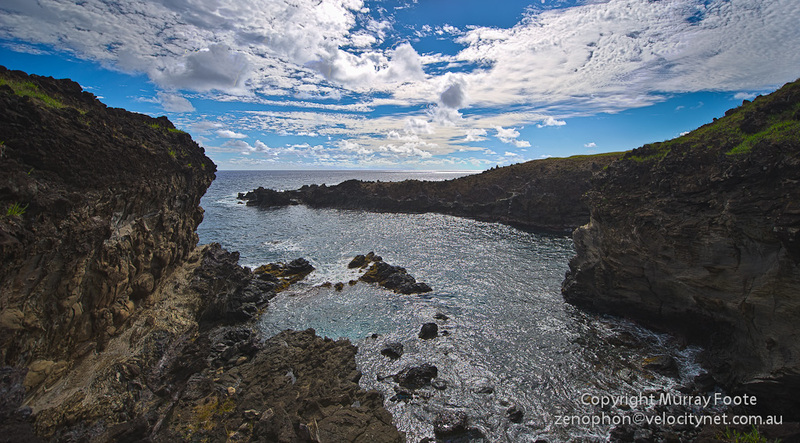 In the mid afternoon of the 25th, I visited Ana Kai Tangata, a cave just on the outskirts of the sole town Hanga Roa. This is also known as the cannibal cave. However, the name of the cave is ambiguous and it could mean the cave where men eat as well as the cave where men are eaten. It has even been suggested it means the cave that eats men because they disappear into its black mouth. 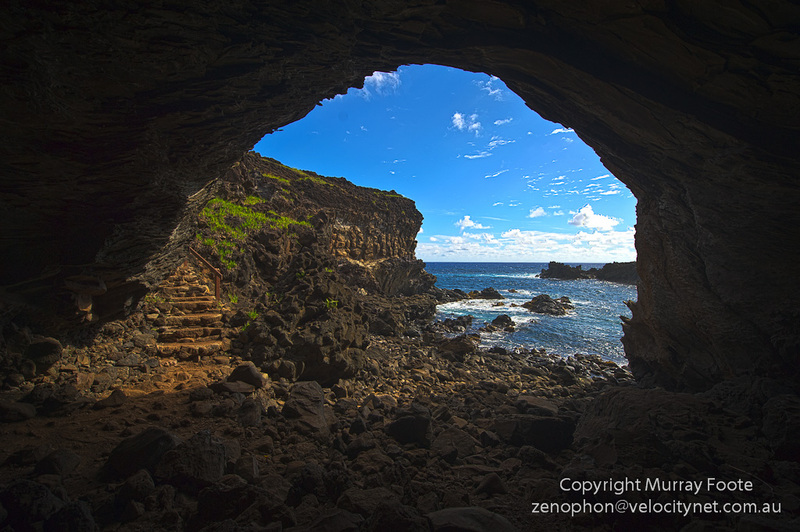 There are many locations in Polynesia where cannibalism occurred to at least some extent; it is possible that cannibalism occurred on Easter Island and in this cave. There are also some references to cannibalism in some Easter Island legends. However, there is no archaeological evidence that cannibalism occurred on the island, so the true state of affairs is unknown. Here is the little bay that the cave looks out onto. 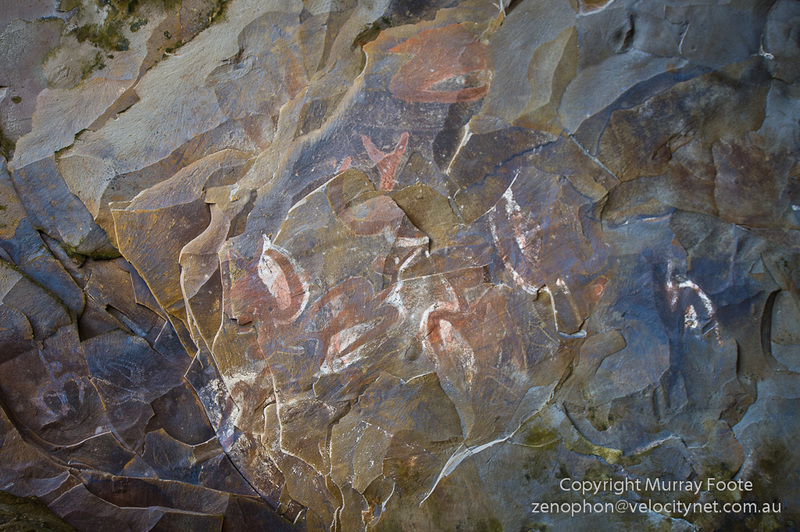 Here we have the main reason to visit the cave, the paintings of manutara or sooty tern, the bird closely associated with the birdman cult that centred in nearby Orongo. The Rapanui may have created the red, white and black pigments by mixing volcanic dust and powdered coral with shark oil. You can see the layers of the flakes of rock in the cave. Unfortunately, they are unstable, salt spray aggrevates erosion, and chunks fall off from time to time. There used to be more paintings and over time there will be fewer and fewer. Here is a view looking out through the entrance of the cave. In the era when wood was scarce, the Rapanui also used the cave as something like a boatshed, a place to build vaka ama, which were small canoes of sewn planks. This entry was posted in Ana Kai Tangata, Easter Island, Isla de Pascua, Rapa Nui and tagged Ana Kai Tangata, Archaeology, Easter Island, Easter Island paintings, Isla de Pascua, Photography, Rapa Nui, Travel.